If you only follow one new blog this year, you must make sure it is A Creative Being. Everything about Wink’s blog is beautiful. The projects, the colours, the photography, everything. 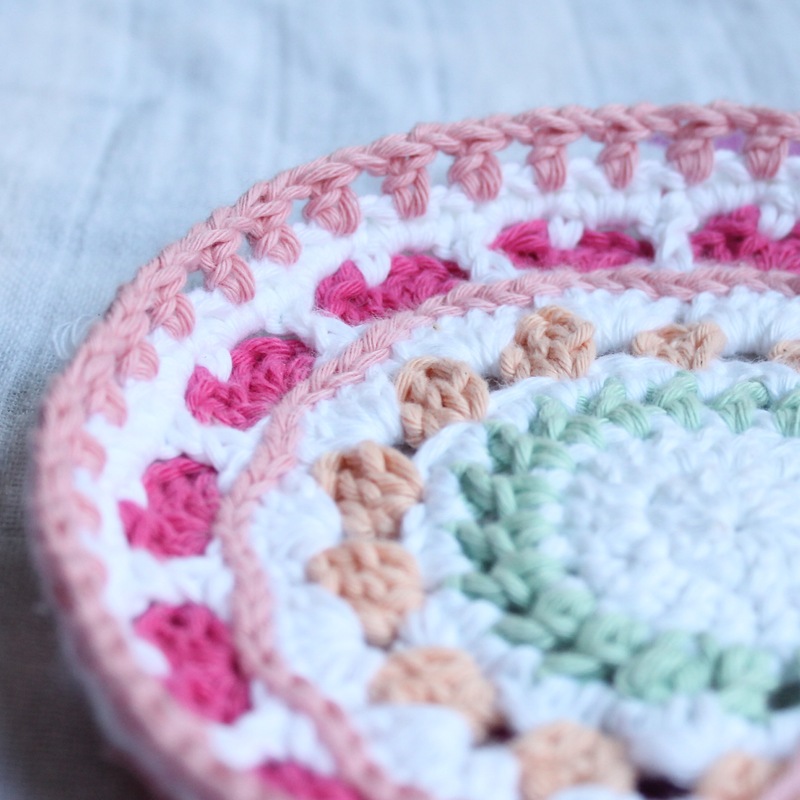 It’s just one amazing package of crochet goodness. I have a few of her patterns, including the Design Wars shortlisted entry Dancing Hearts Wrap and most recently, the Summer Hearts Mandala which is gorgeous, gorgeous, gorgeous! I wanted to create the mandala in line with the Crochet Collective’s Mandala Crochet Along, but I’m just useless at sticking with timelines, my life is just too busy, plus I really wanted to make this mandala as my first, and it wasn’t on their schedule (but there are some extraordinary ones, so check it out). So, I decided to sit down one night and smash it out. And smash it out I did. 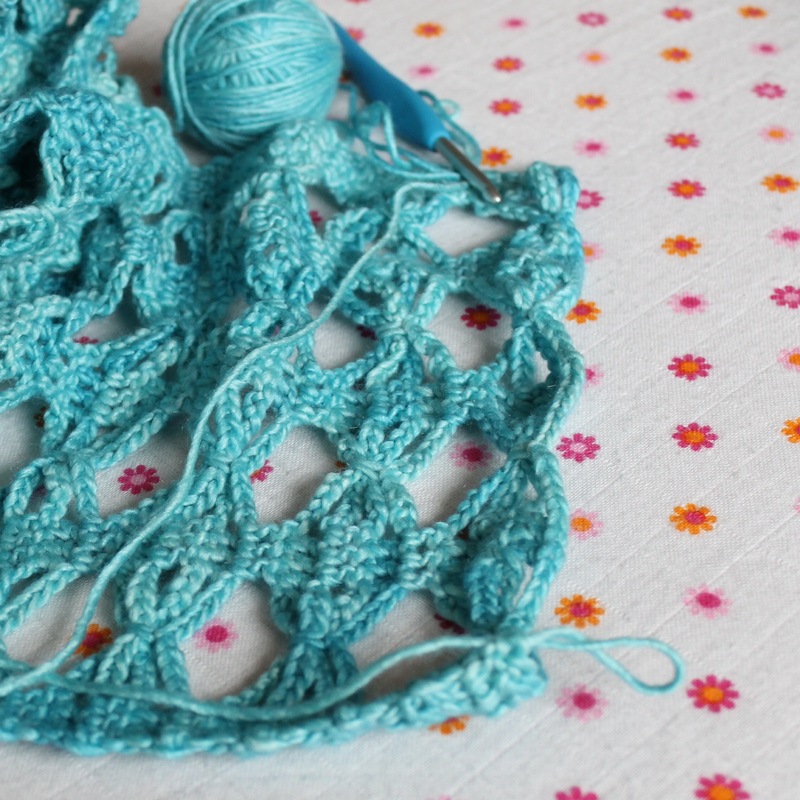 It’s a seriously fast pattern to work up, and it looks amazing. 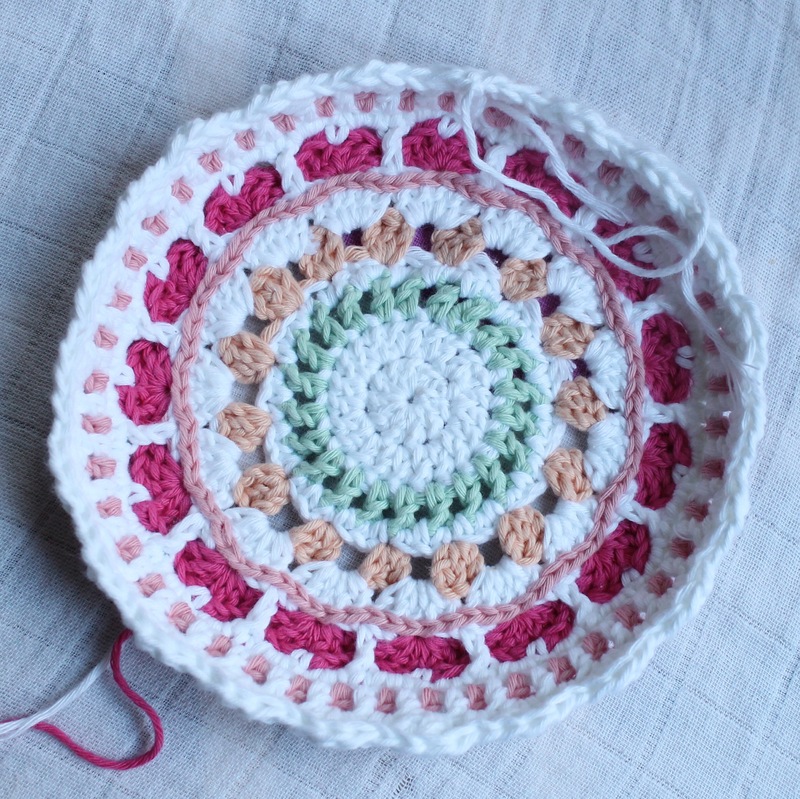 I had the yarn and colours that Wink used (or close enough to) on hand and I couldn’t imagine using anything else. But I had a problem. It’s difficult to see above, but instead of lying flat, the mandala has curled edges. See what I mean? So I decided to leave it for the night as it was late and I was tired, and I wanted to fix it in the morning when I was feeling fresh again. The problem I have is that although I was using the exact same yarn, and the exact same hook as the pattern, my tension is far tighter than Winks, so the edges curled up on me. 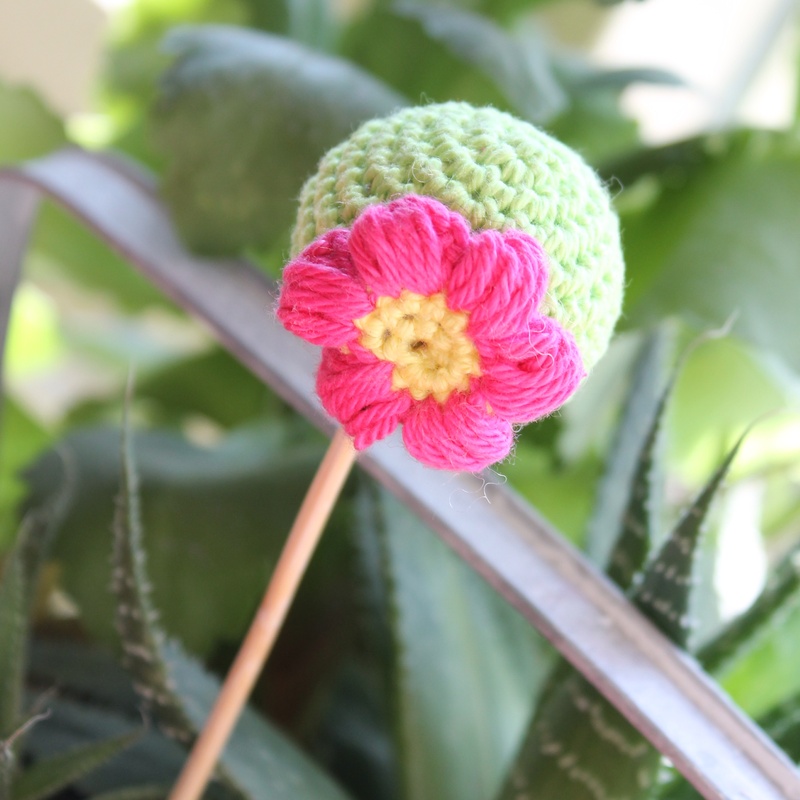 This is a result of all the amigurumi projects I’ve been focusing on – you have to crochet tight so as to keep the stitches close together (I usually use at least one hook size down than what the yarn calls for). 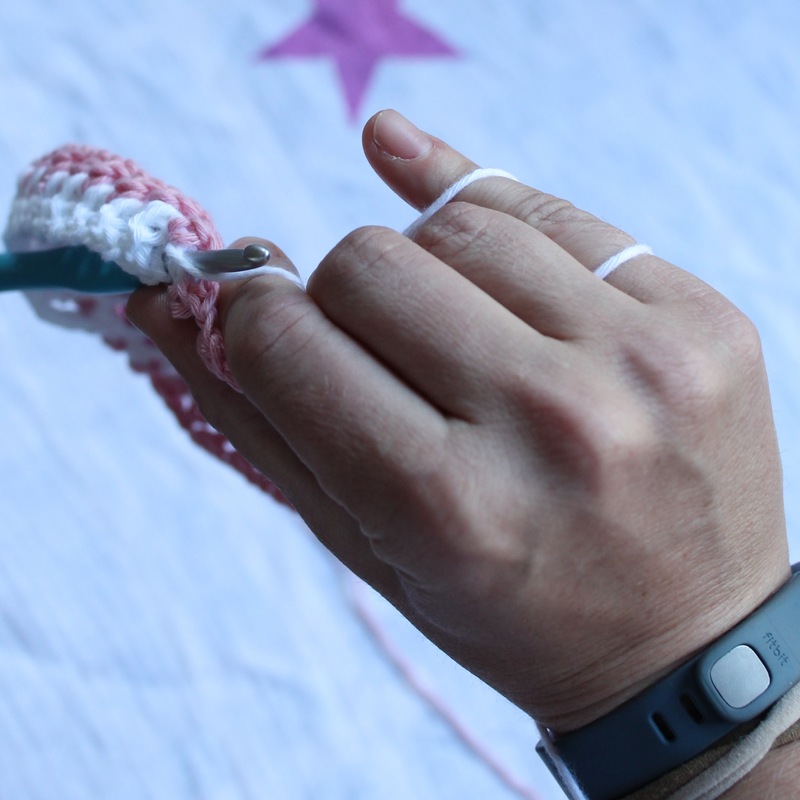 Here’s how I hold my yarn, how do you hold yours? See how tightly wrapped around my little finger it is? 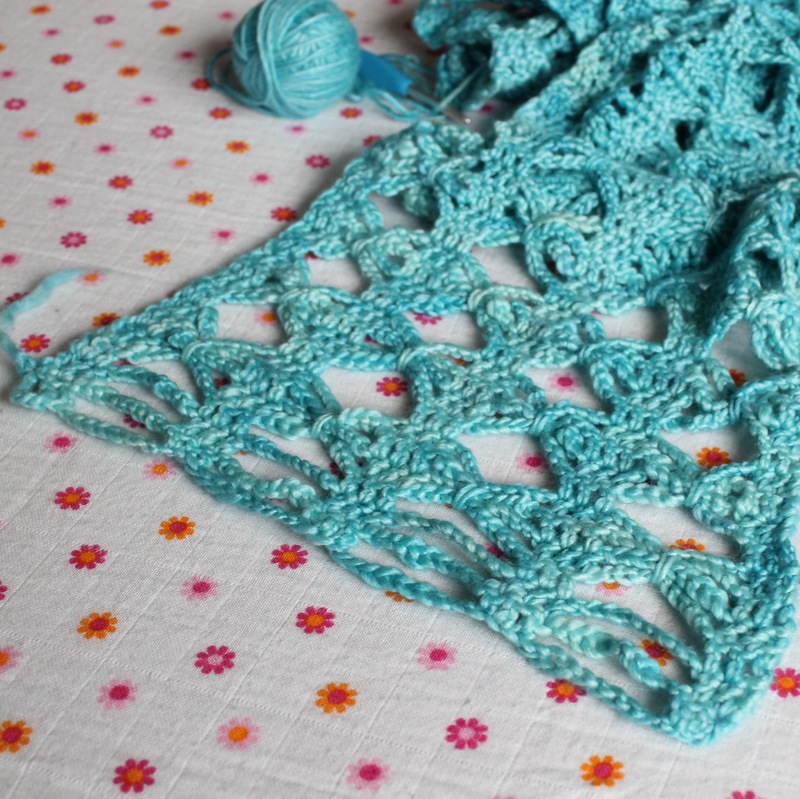 But instead of frogging the entire project, I decided to just rip out the last couple of rows, to where it started to curl. This is the row that was causing the problem, before that I was progressing beautifully. I decided that because it’s difficult for me to loosen my tension (old habits die hard, right? ), I would go up half a hook size and try my best. 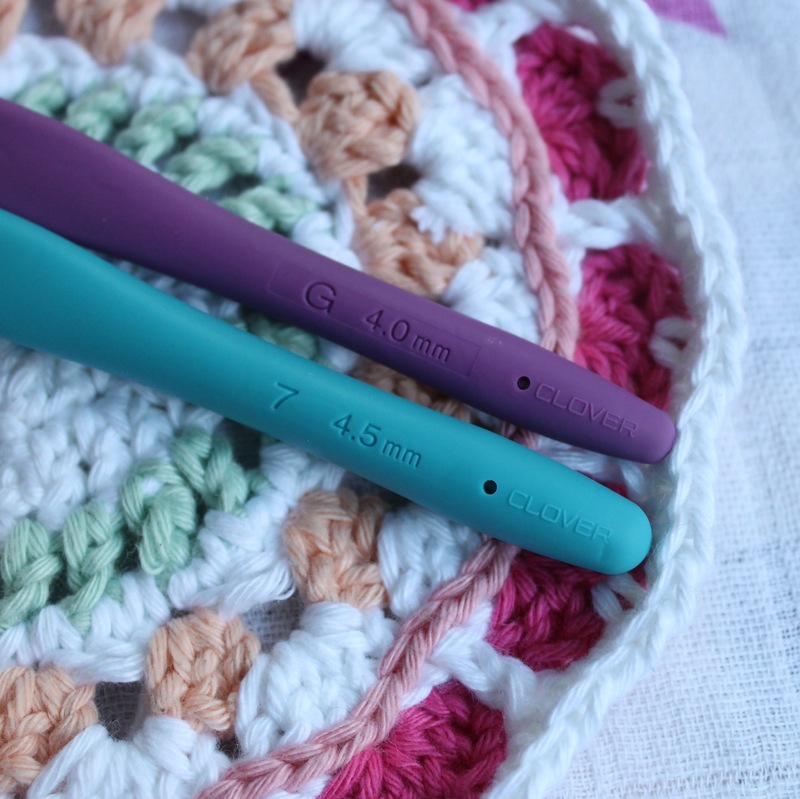 I love my Clover hooks, they are the single best crochet related purchase I’ve made so far. And here we go! The finished mandala! See how beautifully flat it lies now? It has a slight curve, a bit like a saucer, but I think that’s the intention, and I love it. 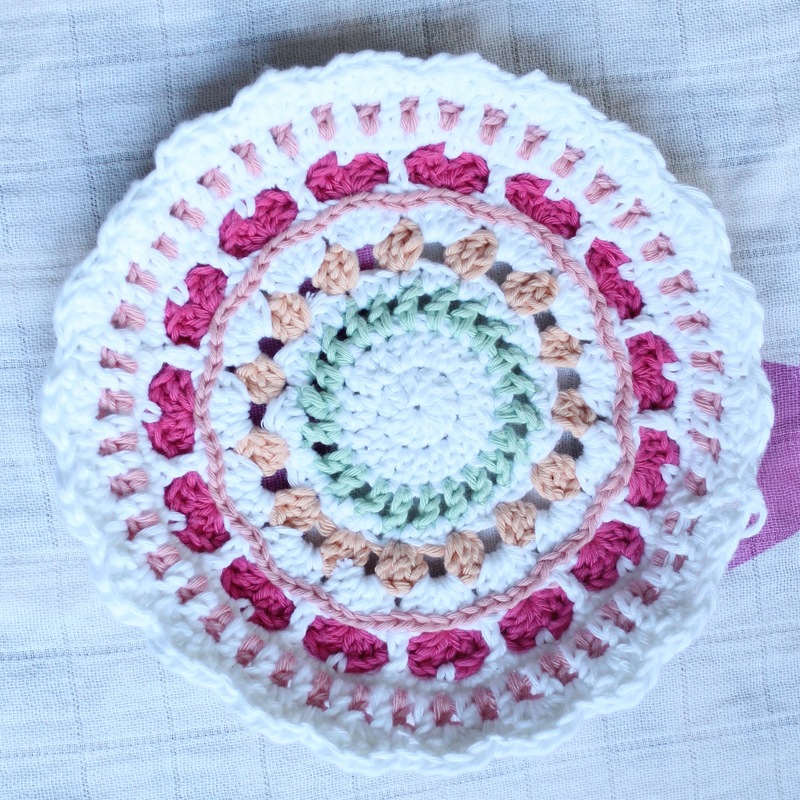 The Summer Hearts Mandala was a beautiful project to make, I’m definitely going to be making more, and will experiment with different colours. Would you like me to make you one? By all means feel free to get in contact, I’d be honoured. 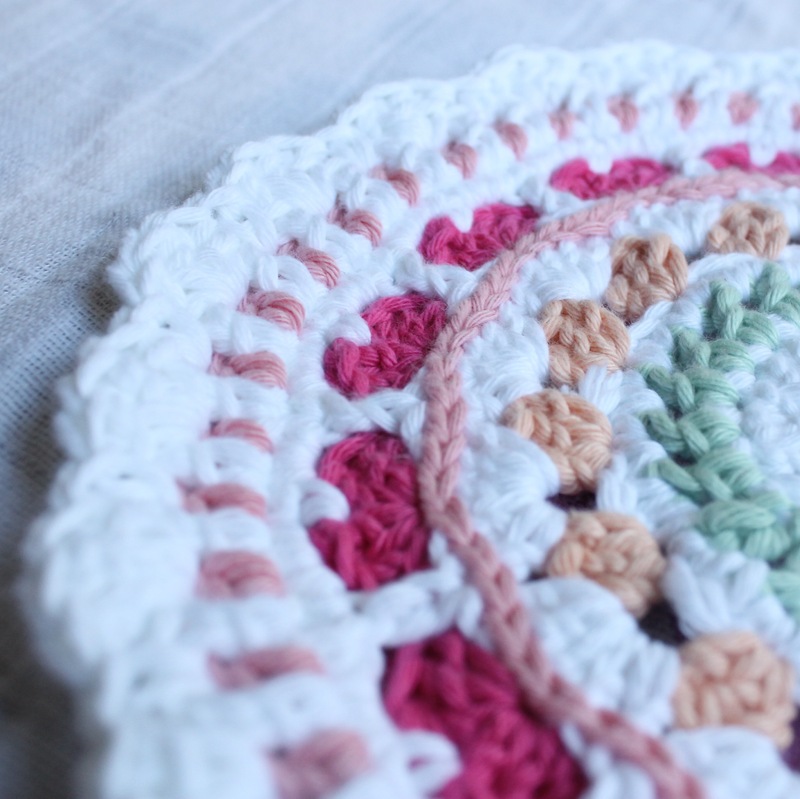 Have you made any mandalas? Which pattern is your favourite? There are so many to choose from and they’re all beautiful. 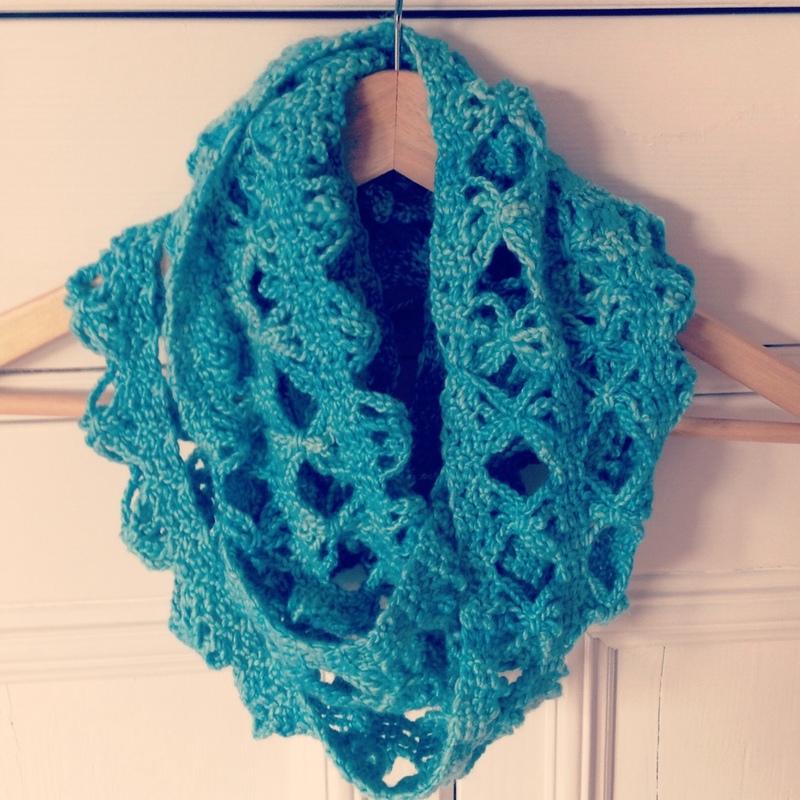 Remember a couple of weeks ago when I shared the Candace Scarf that I made for my mum? Well, in that post I promised a pattern, but of course I completely forgot to follow up until I was reminded at the weekend. Thanks for that Anke! 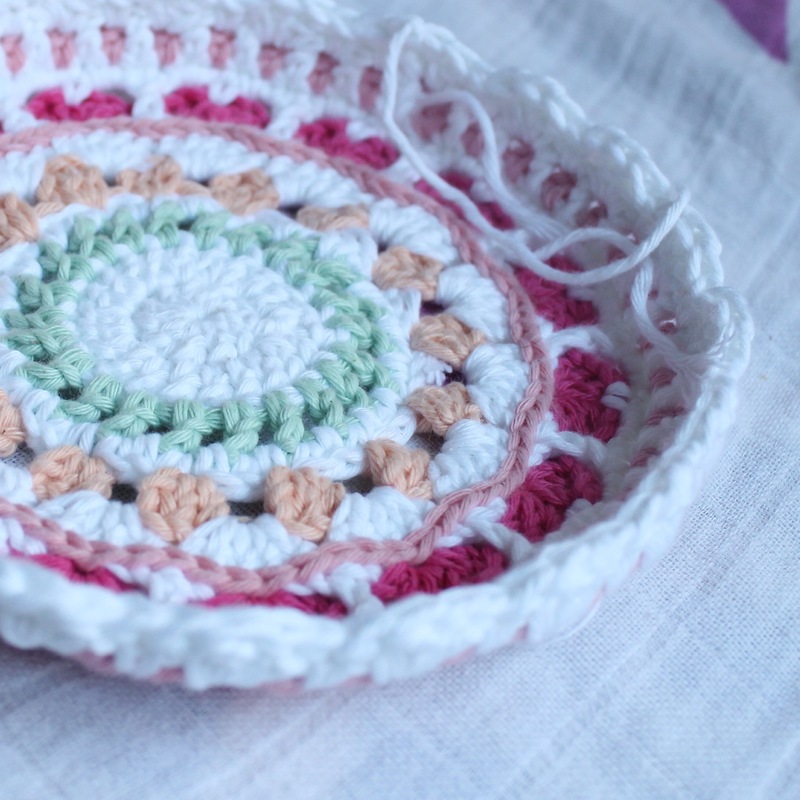 I also promised to tell you how I hacked the pattern as it just didn’t seem to be correct, and I also made it more fluid, so you don’t have to cut and join, which I hate doing! Instead of sewing the ends together as the pattern instructed me, holding both ends of the scarf together and working through four loops at once (both stitches), I single crocheted in the first three stitches (of both ends), chained 5, single crocheted around the three chains, from the beginning end of the scarf to make a bow, then chained 5 again, single crocheting in the next three stitches (all loops, joining both ends of the scarf). I repeated this to the end, fastened off and was done. For me, it just made for a tidier join and also means less ends to weave in! We all hate weaving in ends, right? If you want to retain the trim, you can use this method still, by doing the trim down one side, joining across, then going down the other side. Still no need to fasten off and join to continue, so you should be able to make the scarf in one long piece (except when you run out of yarn and have to rejoin). I made my latest Candace Scarf using Malabrigo Silky Merino, which I picked up from houseofyarn.nl here in the Netherlands. It is such a gorgeous yarn, I promptly bought half a dozen more skeins. I have an order to make a black version, and am now on a mission to find the “perfect black”. My love for minions never ends. A couple of weeks ago I shared with you a new minion in progress here, and now he’s finished and has relocated to his new Gru! I’m so happy with the way he turned out, I think he’s even better than the first one I made. 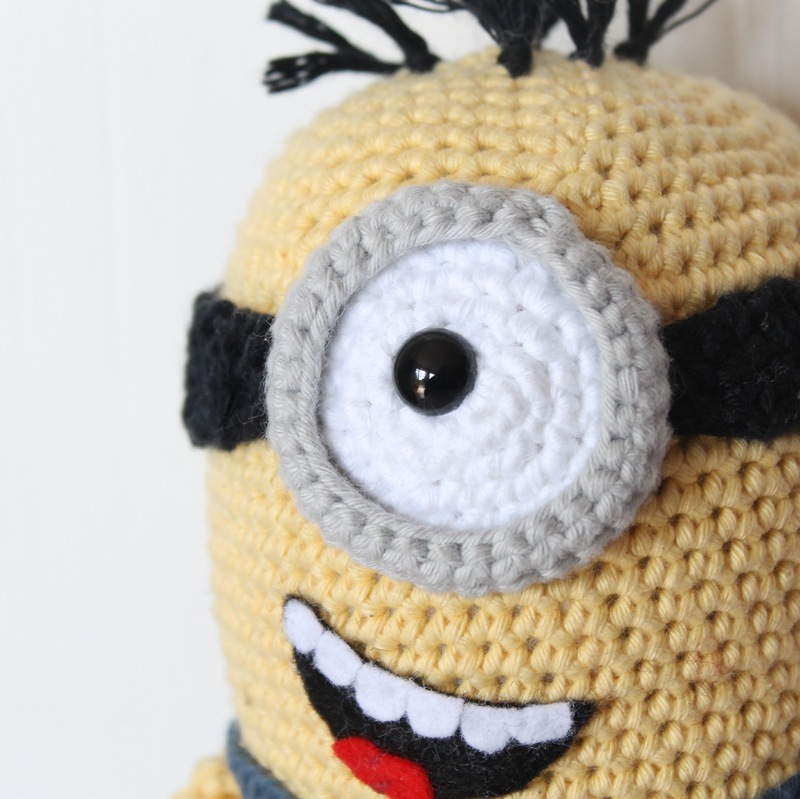 The next phase is to write a pattern for him so I can share the minion goodness with everyone! 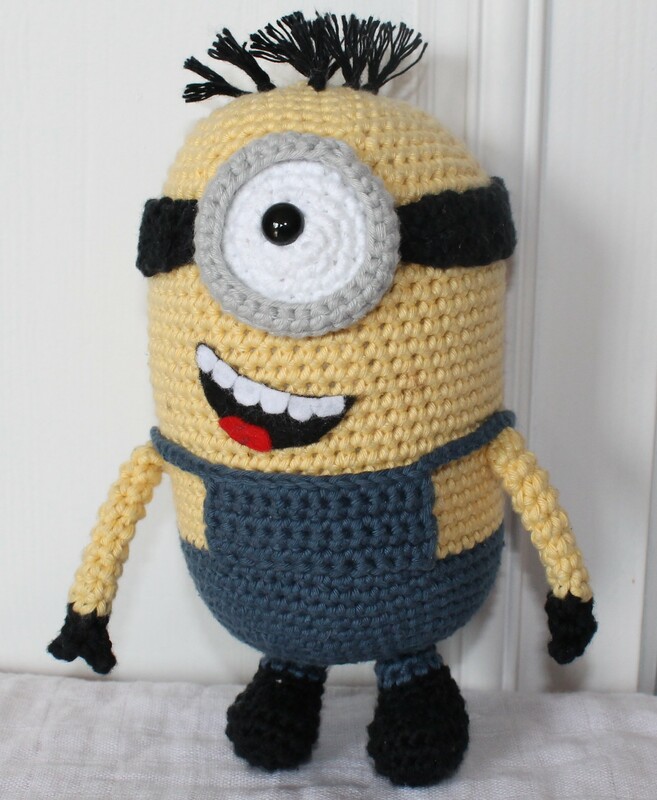 He’s much bigger than other minions I’ve made, and quite a bit fatter. He’s the perfect size for a toddler to play with, and sturdy enough that he doesn’t have to sit on a shelf out of reach. He’s a real toy. I used Drops Paris in yellow and denim and some scrap in white, grey and black for the detailing. I used felt for the mouth and a 10mm safety eye. Holland’s biggest party for the last 100 or so years – Queen’s Day – has been given a revamp. You see, last year Beloved Queen Beatrix decided to retire, and her son, Prince Willem Alexander became the first King of the Netherlands in more than 100 years. Not only do we have a new word to learn – Koningsdag instead of Koniniginnendag (try saying that three times fast), we have a new day to celebrate – 26 April instead of 30 April. Well, I don’t know if this is the permanent date, or just the first date. You see, King Willem Alexander’s birthday falls on 27 April, which this year is a Sunday and he’s decided we can all celebrate on the Saturday instead. So, to celebrate the first King’s Day, I’ve created a new design! Want to get your hands on one? Well, you can! 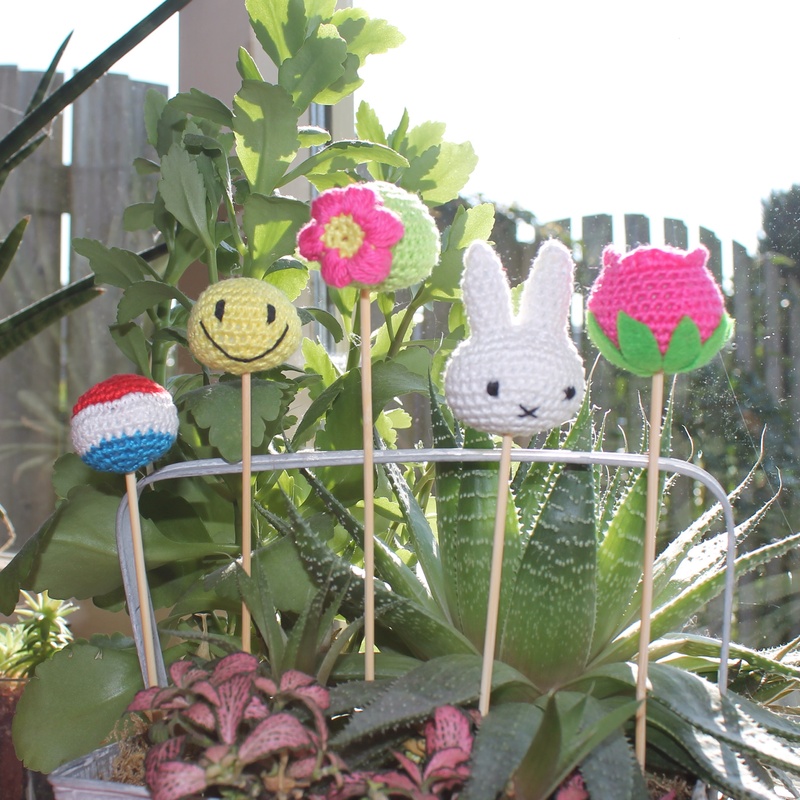 I’m making these for the lead up to King’s Day and they’re available to buy from my Etsy Store! 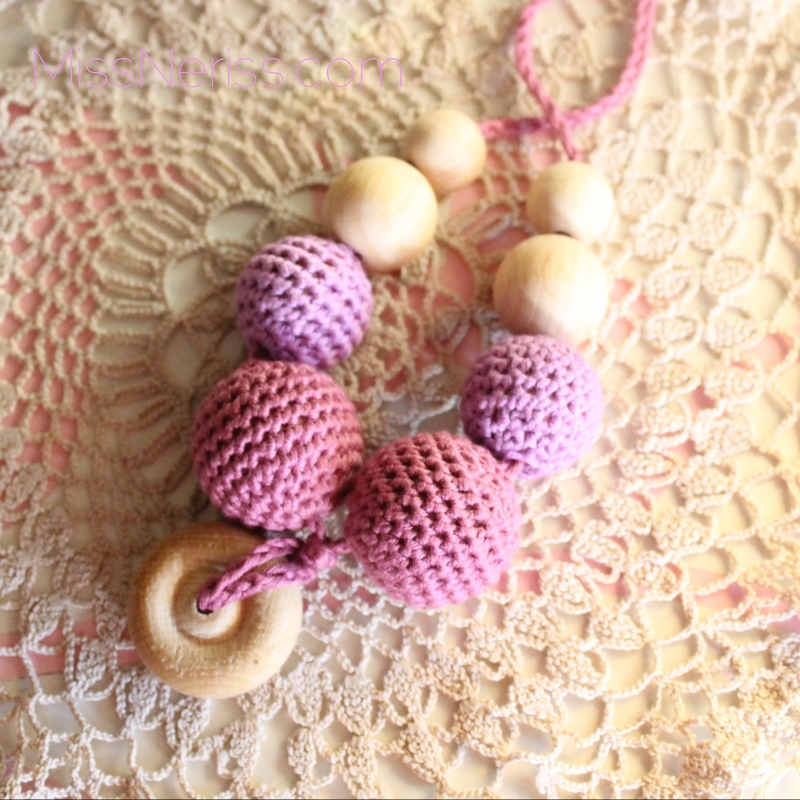 The necklace is €15 euros (plus shipping if you need it) and is made from a nickel-free silver plated chain and delicate cotton yarn. Late last year I visited the KreaDoe exhibition in Utrecht, and it was one of the worst days of my life. It’s the biggest handcraft exhibition in the Netherlands, and all those horrible personality traits that people living in cramped quarters are famous for were out in force. Elbows, shoving, crowding, breathing down your neck in the hopes you’ll move out of the way, the list goes on. Needless to say, I really struggled and even came close to tears at one point. Not the best way to spend a Saturday. When my girlfriends and I arrived, we were all like four year old kids, almost bouncing off the walls with excitement. We were really early, just after opening time, as experience had told us all to get there before the crowds go nuts. The fabulous Breidag location in Amersfoort. And oh wow! The colours were amazing, and I hadn’t even touched anything yet. The first place we stopped was a small fibre stall, where the ladies were demonstrating different techniques for spinning, either using a spindle or a wheel. They also showed us the carding process to create wool bats by hand so that the fibres are all aligned, ready to be spun and become yarn. I started to feel homesick by then. My Grandma taught me to spin when I was very small, and my family all have (or had) home spun, home knitted sweaters. My Grandma is still a wonderful knitter at 81 years of age, and has made some beautiful clothes for my daughter. What I hadn’t expected to come across was the amount of local producers and dyers. I was honestly expecting it to be a hall filled with imported big name yarns, but was so happy to talk to the lovely woman from Textielwek Wol en Zo about her dying process and her passion for the art was obvious. Then there was the husband and wife team from Zeven Katten who import some of the most luxurious (and expensive) yarns I’ve ever seen and also produce their own beautiful yarns. #yarnporn from #Breidag today in Amersfoort. Too many choices, must learn to knit. Want all the pretties! It was also wonderful to meet a fellow Australian, Fiona from Harlequin Yarns, who specialises in hard-to-find-in-Holland yarns and her selection was incredible. 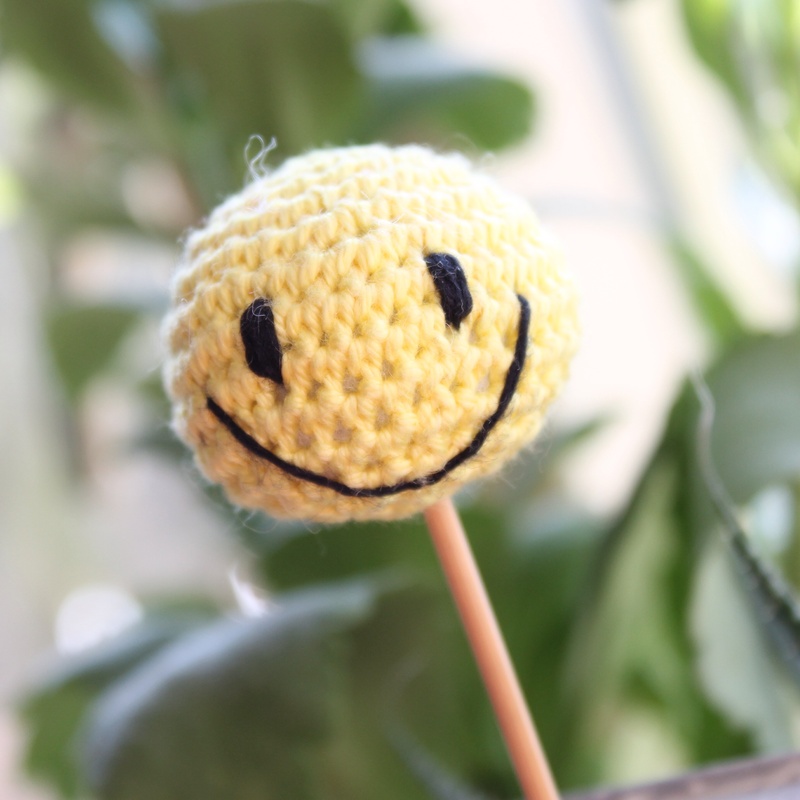 My friend Tammy found almost everything she needs for her list of projects; it was like a one stop shop! Then around the corner was the one spectacular skein of yarn that was 73 euros and another kit to make a shawl that cost even more. I was very quick to realise that this was a day for real yarn aficionados. 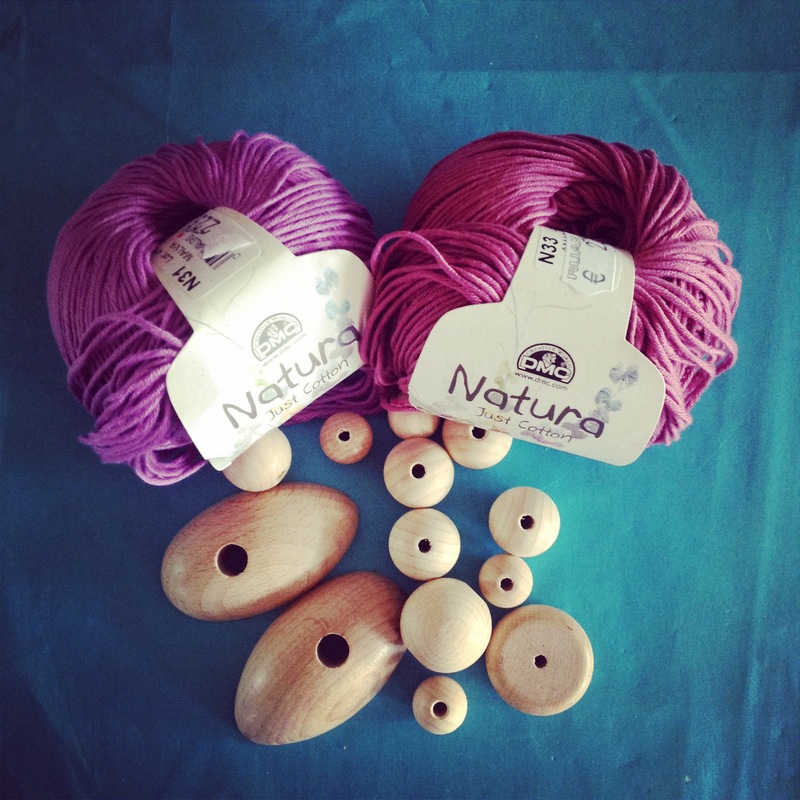 I had hoped to be able to pick up yarn for projects around the 30 euro mark, but there was no way I could come home to my husband with the news that I’d spent 90 euros on one scarf. He’d freak. Then file for divorce. However, I do absolutely see the worth in the yarn, especially when you watch the the artisans at work creating it. You can see how much time and effort and skill is involved and you happily reach into your pocket to support independent designers and craftswomen (and men). The big highlight for me was watching WoolWench Suzy spinning her beautiful art yarn. She presented me with a couple of different bats, so I was able to choose the colour she should work with. I also loved meeting her as she’s a Kiwi, and has worked with wool and in shearing sheds just like I have, and living here I don’t come across many others who have. Creating beautiful #artyarn at Breidag yesterday. It was great to see the #woolwench in action! I had the most wonderful day, it restored my faith in exhibitions. When is the next one..? Any tips for me? 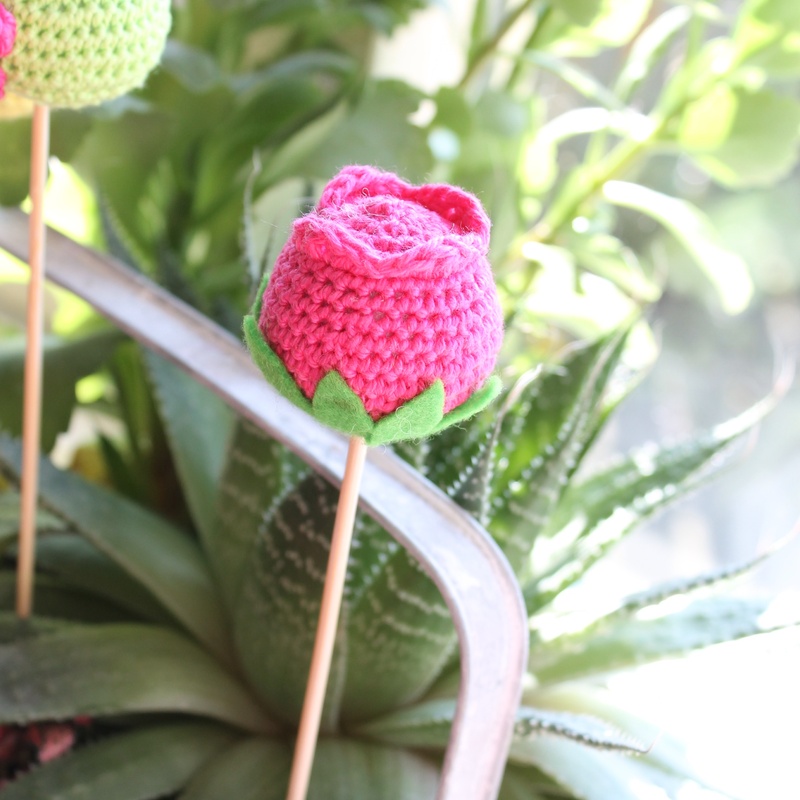 Cake pops…. I love cake pops. My friend Anel has a business where she gets to make beautiful, delicious cake pops all day long and I’m not jealous at all. Not one little bit. There’s no way I’d be able to let that deliciousness out of my sight, I’d gobble it all up. All of it. 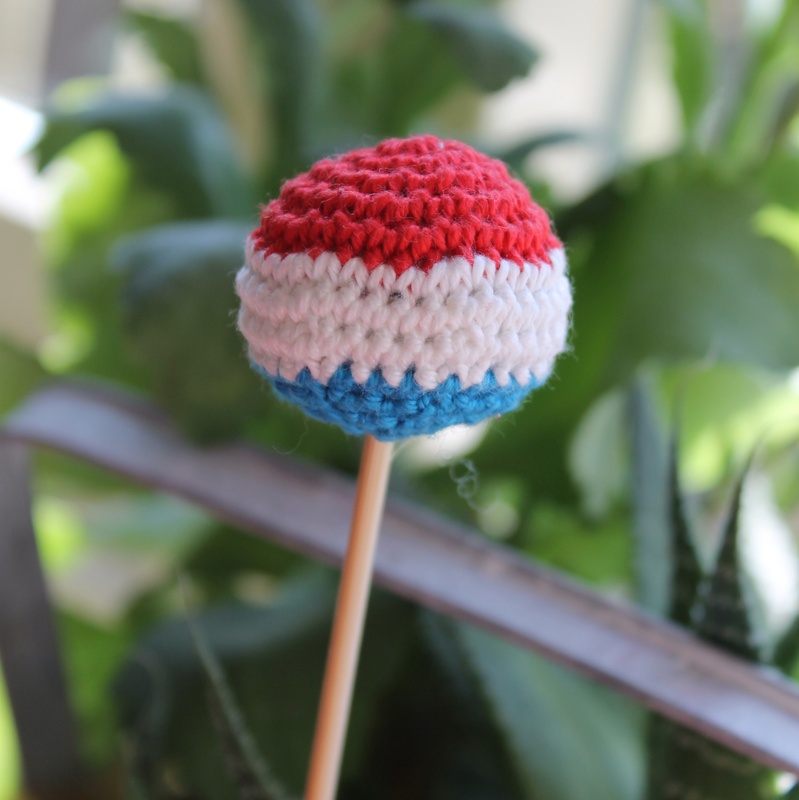 But when Anel asked me to make her some crochet cake pops I jumped at the chance! I could have the best of both worlds, the cuteness without the sugar come down. The brief was broad: no theme, just whatever you want. I love and hate these challenges. I always spend half a day staring at my hands, inspiration-less. But I’m doing some preparation for the first King’s Day in more than 100 years, so making something Dutchie was pretty much a given. Tulips are so perfectly Dutch, that it was obvious that I included one. Perhaps I’ll even make a collection for myself. Spring has really kicked into gear here in Holland, and flowers are peeking out from every patch of grass and garden, it’s probably the most beautiful time of the year here. Pharell has taken the world by storm, simply by being Happy. Can’t be a bad thing, right? 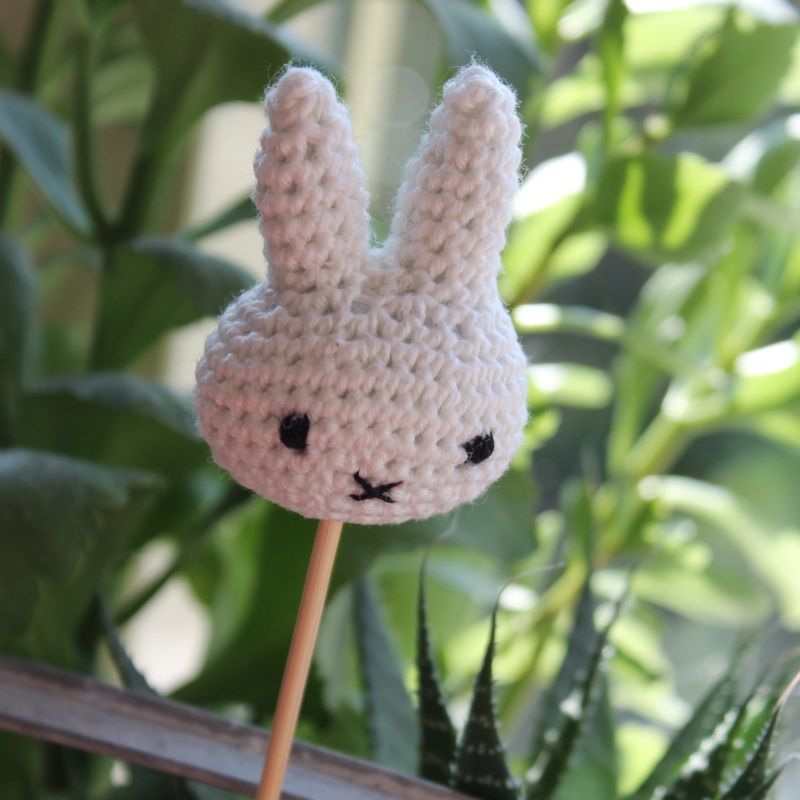 Miffy (or Nijntje as we call her), is one of my favourite kid’s characters, and my daughter loves her. It’s going to be a fight to get this one out of the house. With King’s Day and the World Cup fast approaching, national pride is about to go completely mental here in Holland. Flags, Orange, and the Conga line all feature very heavily in times of celebration, so I have to be ready! I loved making these for Anel, but just looking at the photos makes me want one of the real things. Do pop over and visit Little Cakes, the creations are amazing and delicious. Don’t believe me, look at some of these, you’ll change your mind! For the entire month of February it was zero. That’s right, zilch. Niets. Nada. I don’t know what happened, truly. On January 31 I was busy and happy and enjoying making my mood blanket, then on February 1 it was like the lights went out. I put the progress in the cupboard and was busy with other things that interested me more. But, the guilt became too much. Be damned if I’m going to give up on this project! 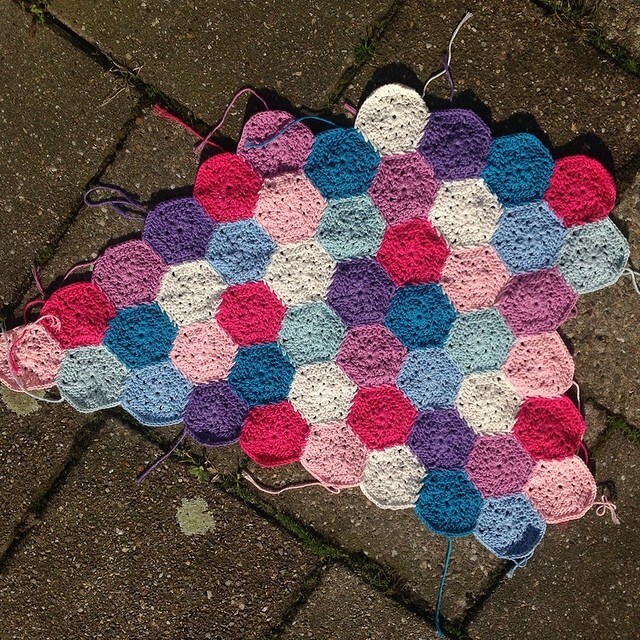 It may not have a years worth of squares at the end, or it may become a cushion (god I hope not), but it will become something! I spent the last few evenings on the couch trying to catch up as best as I could, so as of today (March 4), I’m only about 12 days behind. I’ve completely given up on the mood concept, and am just adding random colours and letting it grow. Finally, a #crochetmoodblanket2014 update. I'm only about 12 days behind, trying to catch up! I still love the colours, and I love the feel of the blanket and it makes me very happy, I just need to be more motivated to finish the bloody thing! Just for your info, I bought the pattern for the blanket from babylovebrand.net and the yarn is Cotton Light by Drops. What do you think? Worth the investment in time?